After all the requests I have finally filmed a curly hair tutorial. I hope you all love it! Casual outfits have been 'low key' my favorites lately. & yes, these Shelly's London wedges are considered casual to me. The wedge makes it super easy to walk around without stumbling. 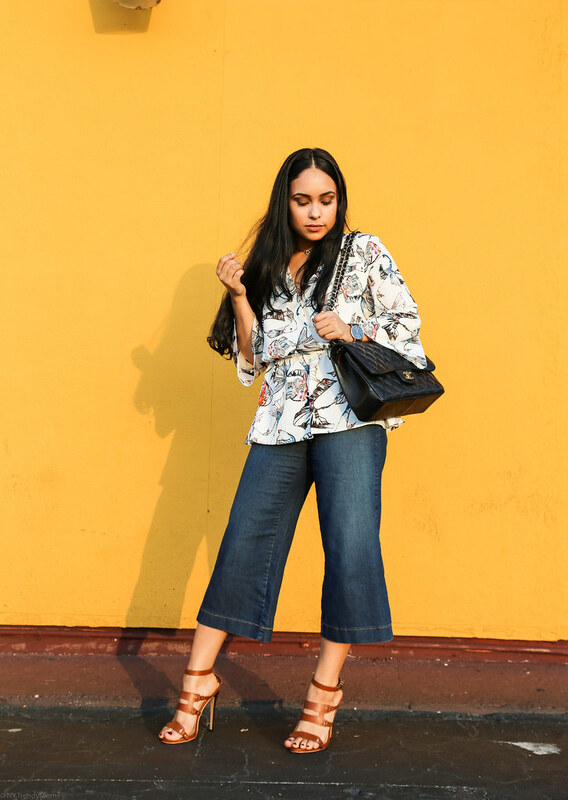 One of my favorite ways to wear wedges is with denim and we all know there aren't better denim than classic Levi's. I folded up my light wash pair to allow the lace from the shoes to show. This gives the look a much personal feel. 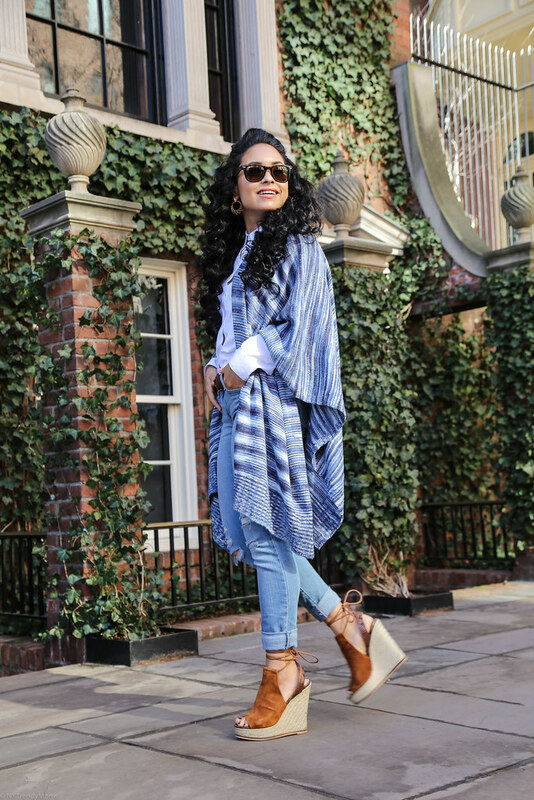 Did you know this blue poncho looking piece from J.Jill is actually called a 'ruana'? I just discovered the difference and I'm fascinated. The difference between a poncho and a ruana is that a poncho is one piece with a whole to put your head in. The ruana has a slit in the middle and you're able to see what you're wearing underneath. I wanted to keep the look clean and fresh so I went with a white shirt from J.Jill. I lost count of the many times I've worn this shirt. It's definitely a favorite. The brown allows the blue from the ruana and denim to pop*. I added a beautiful Deux Lux bag to the outfit to compliment the wedges. Keep reading to see more photos. Los looks casuales han sido mis favoritos últimamente. Y sí, estos zapatos de Shelly's London son considerados casuales para mí. Una de mis maneras favoritas de usar estos zapatos son con pantalones y todos sabemos que no hay mezclilla mejor que Levi's. Enrolle los pantalones hacia arriba para permitir que el cordón de los zapatos se mostraran. Esto le da un toque personal al look. ¿Sabías que esta pieza que parece un poncho se llama realmente una 'ruana'? Acabo de descubrir la diferencia y estoy fascinada. La diferencia entre un poncho y una ruana es que un poncho es una pieza con hueco para poner la cabeza. La ruana tiene un abierto en el centro y usted puede ver lo que está usando debajo. Quería mantener el aspecto limpio y fresco así que fui con una camisa blanca de J.Jill. Perdí la cuenta de todas las veces que he llevado esta camisa. Definitivamente es una de mis favoritas. El marrón permite que el azul de la ruana se vea mas destacado. He añadido una hermosa bolsa de Deux Lux para completar el look. Sigue leyendo para ver más fotos. Now that New York Fashion Week is over I can finally share what I wore to the Laurence & Chico presentation. I'm wearing two pieces from ASOS which are not yet available as it will be released in Spring 17'. This pale tinted purple color otherwise known as lavender will be everywhere this Spring. So get ready. You heard it here first. Ahora que la Semana de la Moda en Nueva York ha terminado, finalmente puedo compartir lo que llevaba en la presentación de Laurence & Chico. Estoy usando dos piezas de ASOS que aún no están disponibles, ya que serán lanzadas en la primavera 2017. Este color púrpura también conocido como lavanda estará por todas partes esta primavera. Así que prepárense. Lo escucharon aquí primero. If you're like me then you know being a girl is a little more complicated than everyone thinks. We think about every little detail to make a special day/night unforgettable. & since Valentines Day is around the corner I wanted to share a collection that is as sweet as can be. This is Clarins new Limited Edition Tender Moments collection. 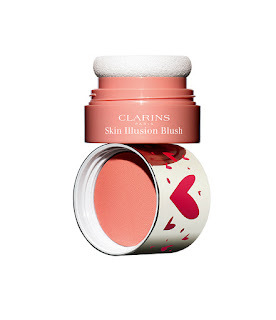 The collection includes a Daily Energizer Lovely Lip Balm and a Skin Illusion Blush which comes in three shades. The Daily Energizer Lovely Lip Balm's texture is lightweight while still providing the right amount of moisture to the lips for up to 8 hours of hydration. The pigment reacts to the pH of your lips which creates a unique and beautiful shade of pink. It's formula includes cocoa, shea butter and red currant. The Skin Illusion Blush is an ultra-fin powder which is filled with minerals and pure plant extracts. The packaging of this blush is amazing as it's not only small enough to fit in a clutch but it also includes a mirror and a powder puff for easy application. 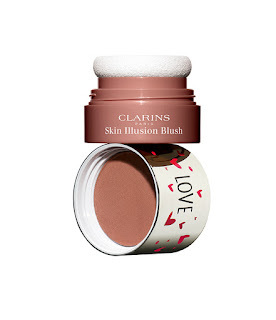 As I mentioned before, this blush comes in three shades: Luminous Pink (01), Luminous Coral (2), and Golden Havana (3). Si eres como yo entonces sabes que ser una chica es un poco más complicado de lo que todo el mundo piensa. Pensamos en cada pequeño detalle para hacer un día/noche especial inolvidable. Y ya que el día de San Valentín está a la vuelta de la esquina quería informarles sobre una nueva colección. Estoy hablando de la nueva colección Tender Moments de edición limitada de Clarins. La colección incluye un Daily Energizer Lovely Lip Balm y un Skin Illusion Blush que viene en tres tonos. La textura de Daily Energizer Lovely Lip Balm es ligera y proporciona la cantidad correcta de humedad en los labios hasta por 8 horas de hidratación. El pigmento reacciona al pH de tus labios, lo que crea una tonalidad única y hermosa de rosa. Su fórmula incluye cacao, manteca de karité y grosella roja. I wore this look to go to dinner over the weekend in Miami. I wanted to share it during this time because it's also a very pretty Valentines Day look. The print on this Cooper & Ella top is very feminine and romantic. Ideal for a day date. Lleve este look para ir a cenar durante el fin de semana en Miami. Quería compartirlo durante este tiempo porque también es un look muy bonito para el día de San Valentín. La camisa de Cooper & Ella es muy femenina y romántica. Ideal para salir durante el día. Welcome back guys! 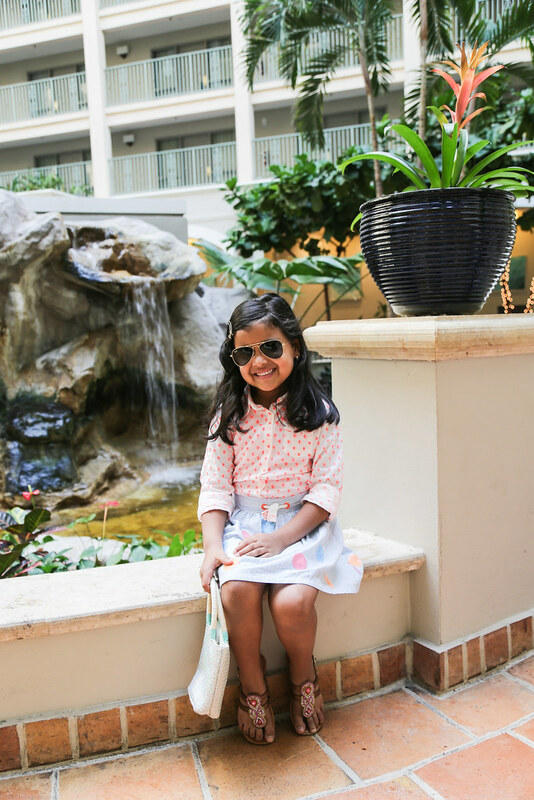 Today I'm sharing a look which I wore for dinner on my recent cruise. This look was a huge hit on social media. Therefore, I decided to share more photos on the blog. Hola chicas! El look de hoy me lo puse para cenar en el crucero. Como muchos de ustedes me preguntaron de el vestido quería enseñarles mas fotos aquí en el blog.